How’s this for steaming hot style? The new HC3300 is the very latest stylish addition to the InSinkErator range. 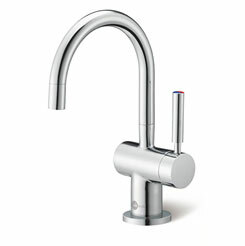 Created to complement contemporary kitchen design, it dispenses both hot and cold filtered water but – uniquely – has just a single handle. The HC3300 benefits from a hot push-lever locking mechanism.